Andrew initially went through life expecting to become an engineer before eventually realizing that fitness and coaching was the route for him. Andrew and his three brothers grew up playing any and every sport possible, which resulted in many broken objects in the house (sorry, Mom). Andrew was first drawn to fitness as a means to being a better athlete, but soon fell in love with the effects that it had on other areas of life like improving confidence. Andrew graduated from Lindenwood University with a degree in Exercise Science and is a Certified Functional Strength Coach.While an undergrad at Lindenwood, Andrew was a member of the university’s soccer team and volunteered with the school’s strength and conditioning staff. Andrew also completed several internships focusing with helping other athlete’s improve their performance, whether it be by getting stronger, faster, or in better shape. Andrew is currently pursuing a Master’s degree in Human Performance at Lindenwood, where he has joined the men’s soccer team as an Assistant Coach. 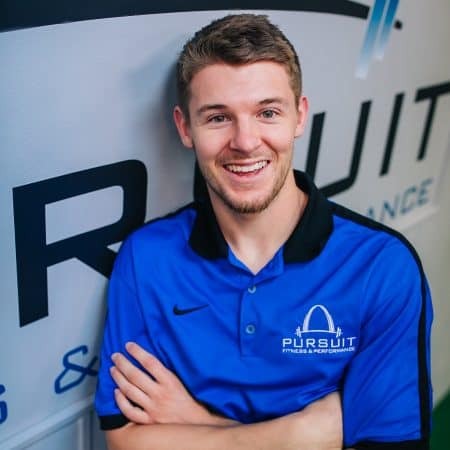 Andrew first heard about Pursuit Fitness and Performance through one of his professors. After hearing the professor hold PFP in such high regards, Andrew knew that he needed to see what all of the fuss was about. Meeting with the staff and being around the members solidified the idea that this was a family that Andrew wanted to join. Andrew is excited to be in an environment with such a positive mindset and to be able to help the many awesome members reach their health and fitness goals.